For more information about Loretta visit her website at www.fanitull.org. For more information about the Hardanger fiddle visit the Hardanger Fiddle Association of America’s website at www.hfaa.org. oretta Kelley is the foremost American performer on the hardingfele (the traditional Hardanger fiddle), an intricately decorated fiddle native to Norway with sympathetic strings, a nearly flat bridge, and a 300-year unbroken aural tradition. 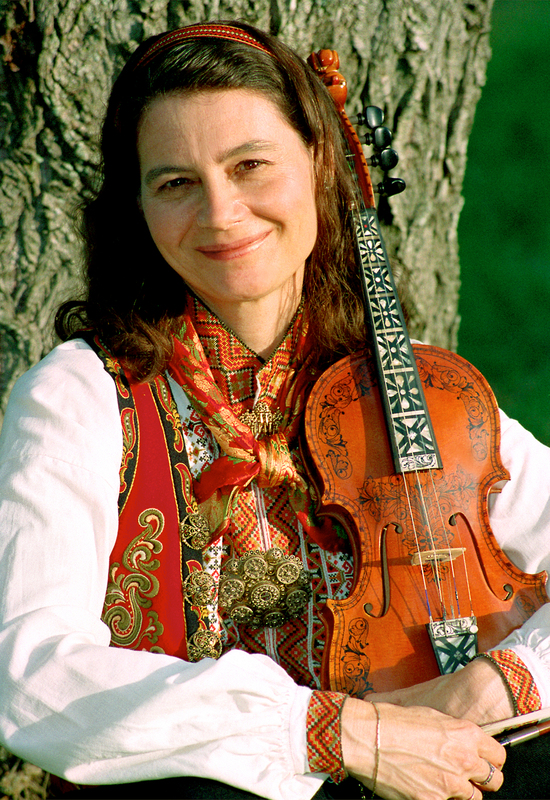 Loretta specializes in slått music, dance tunes rooted in the 18th century with sometimes unique asymmetrical rhythms, modal scales with "floating" intervals, and haunting tonalities. Born in California, Loretta began classical violin and piano lessons as a child. In 1976, already active in ethnic folk music and dance, Loretta began her love affair with the hardingfele when she met Sigbjørn Bernhoft Osa, virtuoso hardingfele player and Norway's “musical ambassador to the world.” Immediately smitten with the instrument and its music, she threw herself into learning the Norwegian language, and in 1979 she spent a year in Western Telemark, studying and performing with local fiddlers. Since then she has made nearly twenty trips to Norway to study with masters of this unique local instrument. In a country that protects its traditions vigilantly, Loretta Kelley is regarded with tremendous respect for her talent, skill, and devotion to Norway’s national instrument. She has been invited to perform in numerous venues, and her playing was featured in an hour-long program on Norway’s national radio station. She has consistently placed well in fiddle contests, and has accompanied many top Norwegian dancers in their own competitions. She has contributed articles to Norwegian books on the instrument and on one of its foremost players, and has done considerable research on the hardingfele traditions of two valleys. At home in America, Loretta continues to promote the hardingfele and its music through performance, teaching, publishing, and translating. An inspiring teacher and brilliant dance musician, she continues to be a crucial staff member at Scandinavian music and dance camps and workshops throughout the US. An active member of the Hardanger Fiddle Association of America (www.hfaa.org), having served as president and member of the Board of Directors among other positions, she assists in the revival of am intrument which was first brought to North America by the wave of Norwegian immigrants that began in the 1850s. Loretta’s performances include appearances on Garrison Keillor's Prairie Home Companion and American Radio Company, National Public Radio’s All Things Considered, The Kennedy Center’s Millennium Stage, and The Christmas Revels. She has released four recordings. The first two, Dansekveld and AmerikaSpel, are largely solo recordings. Loretta also collaborated with two other leading lights of Scandinavian music in America, Andrea Hoag and Charlie Pilzer, on a pair of highly acclaimed CDs of traditional and recently-composed Scandinavian tunes. Hambo in the Barn (1996) and Hambo in the Snow (2006) were released on the Azalea City Recordings label, a musicians’ cooperative. Hambo in the Snow was nominated for a 2007 GRAMMY Award as Best Traditional World Music Album.